A photographic identification guide to the 150 reptile species most commonly seen in Sri Lanka. High-quality photographs from the authors are accompanied by detailed species descriptions, which include size, distribution, habits and habitat. The user-friendly introduction covers fascinating information on folklore associated with reptiles, snake topography, how to deal with snake bites and a glossary. 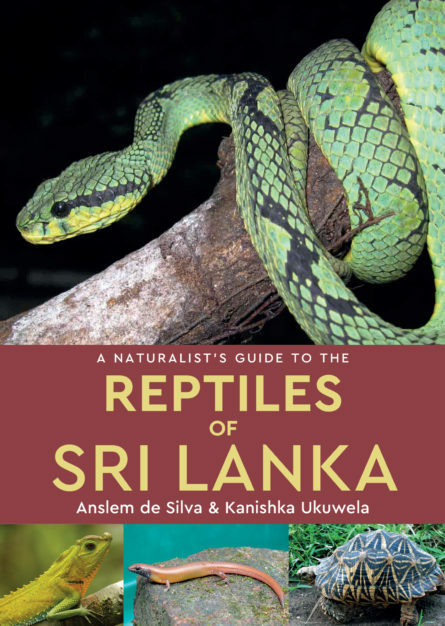 Also included is an all-important checklist of all of the reptiles of Sri Lanka encompassing, for each species, its common and scientific name, and its IUCN status. Anslem de Silva MSc., DSc. (Hon Cau, University of Peradeniya), has written or contributed to 400 or so publications on various aspects of the herpetology of the country. He has received the President’s Award for Scientific Publications three times and has organized several national and international herpetological conferences. His honorary doctorate was awarded in recognition of his scientific contributions to and promotion of all aspects of the herpetology of Sri Lanka. Kanishka Ukuwela is a Senior Lecturer in Zoology at the Rajarata University of Sri Lanka. He holds a BSc degree in Zoology (University of Peradeniya) and a PhD in evolutionary biology from the University of Adelaide, Australia. Kanishka has published many research papers on the reptiles and amphibians of Sri Lanka, and is also a member of the IUCN Amphibian and Sea Snake Specialist Groups.